Welcome back, judges! 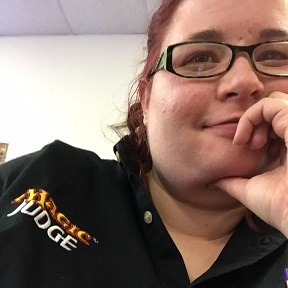 This week we’re speaking with a judge who uses her influence in the Magic community to help puppies! Congratulations to the Mother of Dragons herself, Meg Rickman. Why did you become a Judge? For the people. I accidentally befriended a judge at an event and the rest is history. 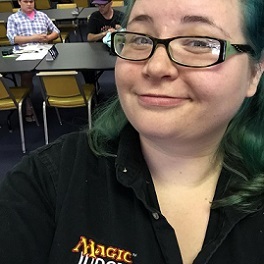 Best tournament result: I once top 8d a Sealed PPTQ while in 9th place. Random fact about yourself: I once tripped in the doctor’s office and cut my knee open bad enough to get stitches. The thing I tripped over? The ‘Watch Your Step’ sign. The person who nominated you said, in part, “She’s a teacher by day and I think that she has a lot to offer the Judge Program in that regard.” Do you think teaching helps with being a better judge? Absolutely. The people skills I’ve developed through teaching translate so easily into judging, specifically in player management. From happy players, to distressed, to angry, I’ve seen them all and for most, I can bring them down easily. I’m also very good at making a player feel like I care (and of course, I actually do). 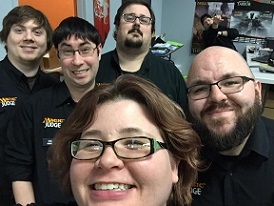 That connectivity lets players open up, not just at events, but also in my area. I’m the judge that people come to when there’s an issue with a player or store being awful. My communication skills also help me explain rulings and card interactions more clearly as well. Granted, I still get nervous and stumble, but I can impart information more readily. This actually happened while I was playing at an event. I overheard an interaction at the table next to me that was being handled wrong so I called a judge on their match who straightened everything out. Fast forward about six months, one of the players in that match walks into my local game store. When he spotted me, the first thing he said was, “You’re the girl who called a judge on me!” Now he’s one of my closest friends. We joke about that a lot. Build on your soft skills! While rules and policy knowledge are important, most players remember the judge, not ruling, even if the ruling goes poorly. The way you conduct yourself is huge, not only for building judge/player relations, but also for building your brand with local and large TOs. At the end of the day, this game and this program are about people and the experiences you leave behind. A little kindness goes a long way to making sure that person has a great time. I’ve failed the L2 test twice now. Both attempts were very close to passing but after the second failure, I almost stepped away from the program. It seemed like this insurmountable thing I could never defeat. However, I have some stellar friends and mentors in the program who pulled me back. I’m now working with several judges and hope to finally conquer the test later this year. In a way, I’m actually a little glad I didn’t get it my first time; it’s made me take the time to focus on where I need to improve and really know the rules and policy. Once I am level two, I will be a better L2 because of it. I consider myself very lucky to have the mentors that I have in the program. This crazy journey started when Eric Dustin Brown and I became friends at SCG Baltimore. Since then, he has been an invaluable resource of rules and policy knowledge, as well as keeping me grounded when I get too anxious. He’s taught me that it’s more about how you are as a judge and less about what level you are; don’t let your level stop you. Austin Whitehead was the L2 who certified me for L1. His calm demeanor and patience helped a quiet, cautious judge candidate walk a GP floor with confidence. Austin taught me that patience and understanding can go a long way. 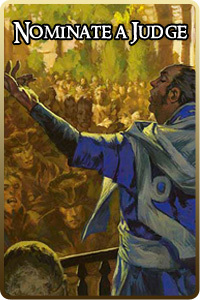 My first GP experience led to meeting Zachary DeLadurantaye ; his enthusiasm is like his name, large and present. I’ve never met a person with more enthusiasm for this program and for my progression through it. He is continually pushing me towards my goals, even when I want to give up and throw in the towel. He has inspired me to buy into my own hype and I’m thankful for his help in building my confidence. And John Temple ; he’s been working with me on a one-on-one basis to rebuild my fundamentals. The individual care he has taken has helped me see the rules in a different light and has accelerated my understanding by light years. The judge community is really very feedback driven, but in a positive way. I struggle with a mental illness that likes to tell me I’m not good at anything I do, so having concrete items like reviews and Exemplar recognitions means that on my bad days, I have something to remind me that the thoughts in my head are from my disease, not from reality. It’s also helped me build a support system that now spans the globe. Magic has introduced so many positive influences into my life through the judges I’ve met and interacted with. I know that I have people there if I ever need to reach out for things. That would easily be the Puppy-TQ I organized and ran. It was a charity tournament for a local animal shelter and we ended up raising over six hundred dollars. My car was also packed with food and other supplies they needed; it took myself and two volunteers several trips to unload it. My players loved the idea and it really brought my local community together for the day as several local stores donated prizes. 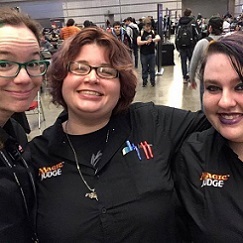 Several judge friends also donated playmats to the cause. 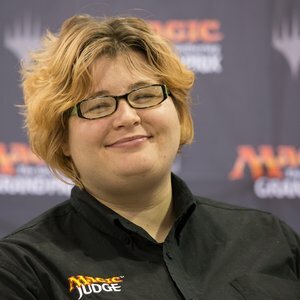 It was really nice to use Magic and judging as a way to do some good in the world. Plus the shelter brought a few adoptable dogs to the store. So I not only got to watch Magic but also got to interact with dogs all day. I’m happy to report we got some of the dogs they brought out adopted! You can read more about it here! Chandra, easily. I have the same fiery drive to make the world a better place. It often doesn’t come out in public, but I can also have a volatile temper at times. And loyalty to my friends is something I embrace above a lot of other things. There are people in my life who have saved me a time or two and I am always looking out to return the favor. I once got a pony for Christmas. When I was 16, I went deep sea fishing and caught a tuna that was almost half my size. I can fluently read three dead languages. While Martha Lufkin came in second at a riding show, she was out-ridden by a 12-year old, not a 10-year-old.